Product typically ships from warehouse within 24 hours. No longer paying for paper towels, freight and tax. No longer having to store paper towels. Save on labor for restocking paper towels and emptying trash receptacles! Save on trash bag liners. Save on wasted paper towels - sometimes from vandalism and sometimes from overuse or dispenser issues. Keep restrooms cleaner - not as messy as paper towels that sometimes don't make it into the trash receptacle. Comes with free quieter nozzle! Please note that these units are meant to be hand dryers and not hair dryers. We also carry hair dryer units. 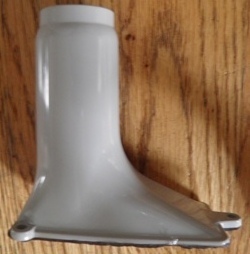 Appropriate mounting heights for these units are listed on the specification sheet above. The 277v is not returnable. Please double check with your electrician that the 277v is the correct voltage you need. Made in the U.S.A. to keep Americans working. 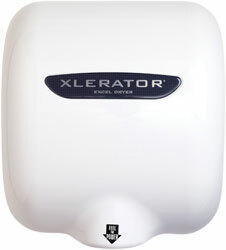 Go to top of this Xlerator Automatic Hand Dryer, White Metal Cover, XL-W page.